The Naytahwaush Nightriders Snowmobile Club announced this year’s Ride for Hospice raised $5,108 for Hospice of the Red River Valley. In eight years of the ride, the Nightriders have raised $55,492 to help provide hospice care to patients and families in Naytahwaush and surrounding areas. This year’s event was held February 11-12, 2012. Lack of snow did not deter ten committed riders, seven of whom gathered pledges in support of the event. 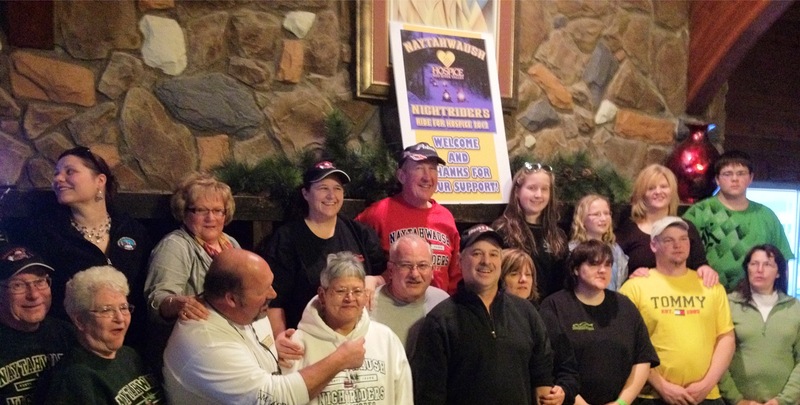 For more information about future events or membership in the Naytahwaush Nightriders Snowmobile Club, please visit http://www.naytahwaushnightriders.com/. For more than 40 years, the Naytahwaush Nightriders Snowmobile Club has been working to promote and advance the sport of snowmobiling. The Naytahwaush Nightriders Snowmobile Club works with snowmobilers, resorts, businesses, government units and local land owners to develop, build and maintain a network of snowmobile trails for recreational use. The Naytahwaush Nightriders are proud to be affiliated with MnUSA (Minnesota United Snowmobiling Association). Hospice of the Red River Valley is an independent, not-for-profit hospice serving all or portions of 29 counties in North Dakota and Minnesota. Hospice care is intensive comfort care that alleviates pain and suffering, enhancing quality of life for terminally ill patients and families by addressing their medical, emotional, spiritual and grief needs. For more information, call toll free 800-237-4629, e-mail questions@hrrv.org or visit https://www.hrrv.org/.